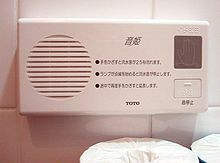 I don't know whether other countries have this kind of devices or not, but here in Japan, more than half of public woman's restroom, except ones located in public parks, have onomatopoeic devices, which can kill the sound of pee. I think the device appeared around 1985. Generally, Japanese women feel embarrassed about their pee sound being heard by other people. Henceforth, until that time, a lot of women including children had flushed the toilet during pee to kill its sound with sound of flushing water. In short, they flushed toilet at least 2 times in bathrooms. Of course it was not friendly to the environment in the light of overuse of water. Hence, household appliance companies developed the device. How to use the device is very easy. Shortly before you pee, push the button, then false sound of water starts, and it lasts for 1 or 2 minutes. In case that the false sound's time length is shorter than yours, you can extend it by pushing the button again. By the way, maybe you can rarely encounter the device in men's restroom.